It's so nice to be appreciated! 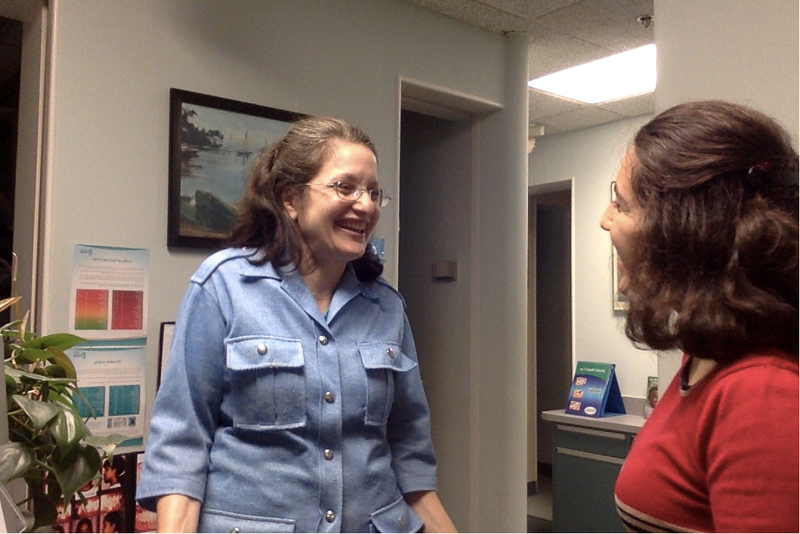 Recently, a new adult patient emailed me, saying: “Hello Dr. Okun, I just wanted to write a quick email and thank you so much for all the time you spent with me yesterday explaining the many different options for my treatment. Your attention to me and my situation was nothing less than truly professional, thoughtful and caring. I left your office feeling like you really cared about my teeth and situation and it was the best visit I ever had to a dentist. I want you to know how much that meant to me and how truly appreciative I am. Thank you from the bottom of my heart. Kindest regards, Tim Boyd :-).” The same day, Gloria, another adult patient in my office, repeated to me what she told her general dentist's hygienist, that she had found a wonderful orthodontist. She told her, “Dr. Okun takes care of her patients; Dr. “X”,(the orthodontist to which her dentist referred her) only cares about the money.” A few weeks ago I received a letter from a father who was moving out of the country with his family before orthodontic treatment could be completed on his son. He wrote, "Thank you for all of your help with "F"- I am only sorry we don't get the opportunity to send you "L", "M" and maybe even me! The pictures from March 2014 show just how far you have brought him." "I started my treatment with Dr. Okun 3 months ago and was immediately impressed with how thorough she is. She takes a minimalist approach to your treatment and recommends treatment as if you were her kid. Her main interest is the longevity of your teeth. She is flexible with payment plans and scheduling appointments is very easy. So far I am really enjoying working with her as my experience with my first orthodontist was less than desirable." "Dr. Okun is very thorough always taking time to explain everything to my children and me. 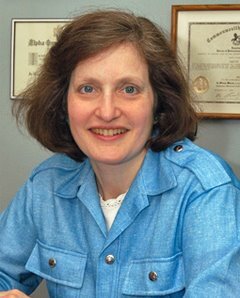 She's experienced and very skilled and a wonderful Orthdontist. We highly recommend her practice." "Dr. Okun always takes the time to explain everything to both my children and myself. I can say this both as a parent and a patient. She is always friendly and honest and the results are wonderful. I recommend her for all of your orthodontic needs." Multiple conversations with local dentists are coming to the same conclusion: Invisalign may make the front teeth look straight, but it doesn’t create great occlusions. The smile may look nice, but the bite doesn’t work. Recently the patient pictured above came in requesting that I order more Invisalign retainers for her. (She was not returning to the treating orthodontist because she had moved.) She had been wearing Invisalign retainers for many years and was happy with how her teeth looked. She knew that she needed to wear retainers the rest of her life to keep her teeth straight. Orthodontically the result was less than satisfactory. The top teeth overlapped the bottom teeth over 75% in the front (they should only overlap 1-2mm), and unless the patient postured her lower jaw forward, the front teeth could not meet like scissors to cut food. In addition, the gum was “creeping down” on the back teeth so that the roots stuck out. This loss of periodontal attachment is frequently seen in patients that grind their teeth or wear flexible retainers (like Invisalign and Essex retainers) long term. The loss of attachment is accelerated when there is also a little bit of inflammation in the gums (from not brushing effectively and not flossing every day.) I suggested that we change her retention appliance. Rigid retainers would minimize the rate that the gum- coverage of the roots would be lost in the future. 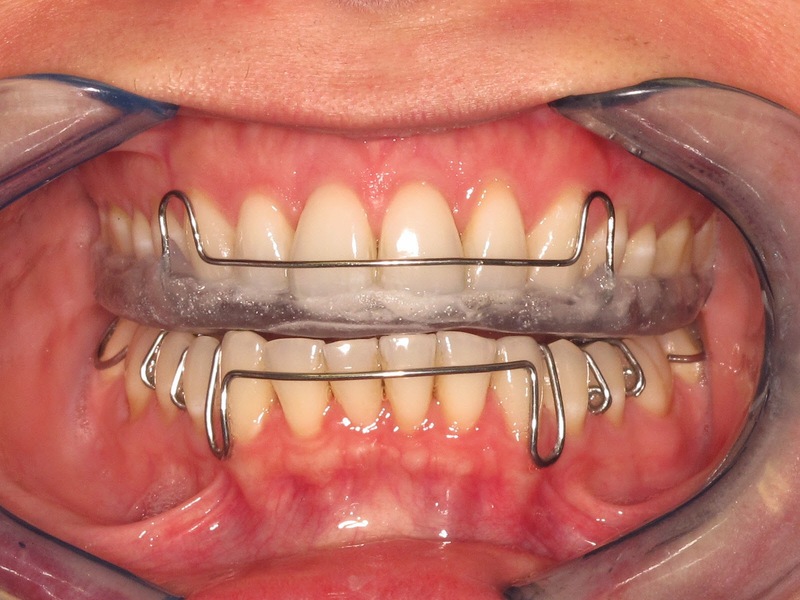 An occlusal guard would give the patient a comfortable place to bite, at least at night when she was wearing it. We decided to make an occlusal guard for the top teeth (a rigid piece of plastic which fits on the top teeth, but is adjusted to touch all of the bottom teeth when the teeth are closed) and a Hawley retainer for the bottom teeth (an orthodontic retainer with a front wire to keep the front teeth aligned with the hard plastic which sits on the tongue side of the teeth). The result was astounding. 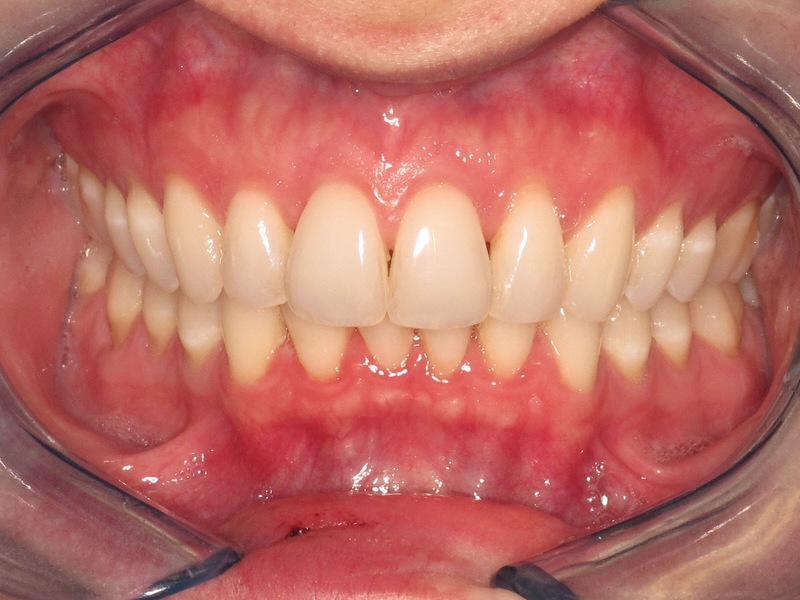 At the visit that the occlusal guard was delivered the patient commented on how comfortable her bite felt, and that her face felt so much more relaxed than it did without the guard. 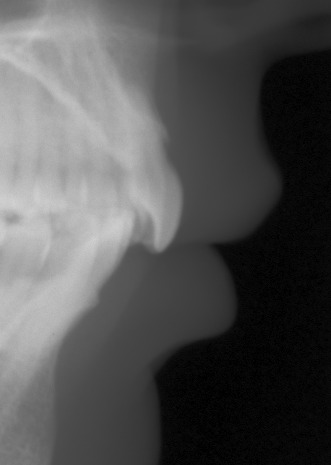 The muscles in her face did not have to work so hard when the teeth were closed on the guard because the bite against the plastic was balanced from "right to left" and "front to back". This never happened when she closed her teeth. 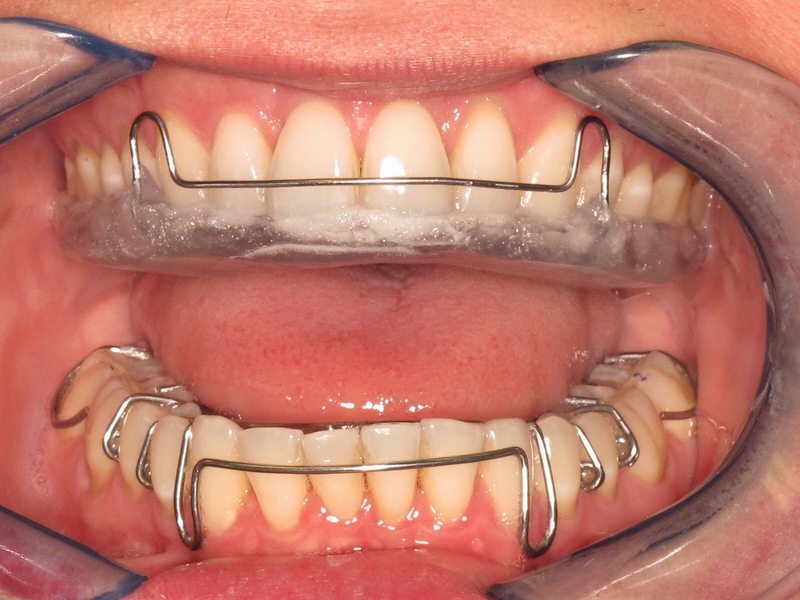 She assured me that she would wear the lower retainer and upper guard every night forever, not only because she wanted to guarantee that the teeth stayed straight, but because they made her face feel so much better. I know that patients will continue to ask for aligner treatment like invisalign, and I know that the results may not always be satisfactory. But as the case above demonstrates, there is a long term solution for these patients which will retain tooth alignment, preserve the bones and gums that hold these teeth in the mouth (i.e. Keep the periodontal attachment), and allow the chewing muscles to relax 1/3 of the rest of their life (i.e. 8 hours out of every 24.) Once again, a patient has left my office happy with her treatment.